Only the 6 meter in Orange The rest is YELLOW! 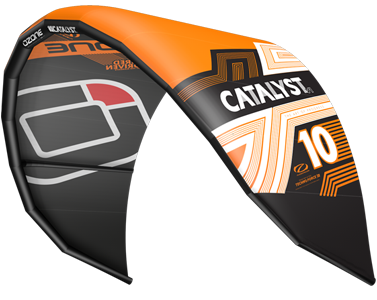 THE CATALYST V1 IS DESIGNED FOR ENTRY LEVEL AND INTERMEDIATE RIDERS – IT’S A CONFIDENCE INSPIRING, FUN AND EASY KITE TO RIDE THAT WILL MAKE YOUR PROGRESSION IN THE SPORT FAST, SAFE AND ENJOYABLE. As with all Ozone products, we pride ourselves with top of the line manufacturing in our own factory using the highest quality materials. The Catalyst V1 is constructed with quality proven Teijin D2 canopy material and Teijin Dacron providing a crisp feel and a strong kite. Wind range is indicative only based on an average rider weight of 80kg. Actual range will vary based on rider skill level and type of board used.